Article after article, step by step, we try to underline the mutual contaminations between the real world and the virtual one (internet). Our web’ sociological analysis highlights new dynamics and changes as well as new customs, ways of doings or communicating which modify thanks to or because of the net. It is no coincidence the fact that for better explaining this social (and virtual) process, we use very strong terms such as “contamination“, “viral” or “global“, even though with a non-negative interpretation, terms generally used for indicating a rapid condition of contagion, resulting from a fast and inevitable spread of a virus. Like other aspects that characterize our daily lives, the game is suffering the influence of the net too. We have already explained in a previous article how Lego has created a community of mindstorm costumers/designers, generating new game dynamics and sharing for new models Lego. Another world-famous brand, the Mattel, has been wondering how to renew his main product, on the line in terms of sale: the Barbie doll. The basis for the new Barbie 2.0 project (deployed in collaboration with the Californian Company ToyTalk) is the precondition to catch the attention of a new generation of children, accustomed to use highly interactive games, proactive, able to stimulate their game. From the social point of view, regardless the advent of internet, it is necessary to underline how the dynamics of the game, based on the Barbie dolls, benefited from the presence of more children in the same family or from groups of “next-door” children who were seeing each other daily, therefore of small (real) communities in support of the game dynamics. The 21st century’s children are generally very interactive, dynamic, demanding and often used to play alone, elements which have put lots of our Barbies in the drawer, even though carefully packed, well-dressed and well-brushed. To identify the main reasons that make the Barbie doll not fashionable anymore, it is necessary to set the qualities of the new Barbie: the new Barbie has to companion the children, to be interactive, assist them in playing, stimulate the curiosity, in other words, SHE must be renewed. 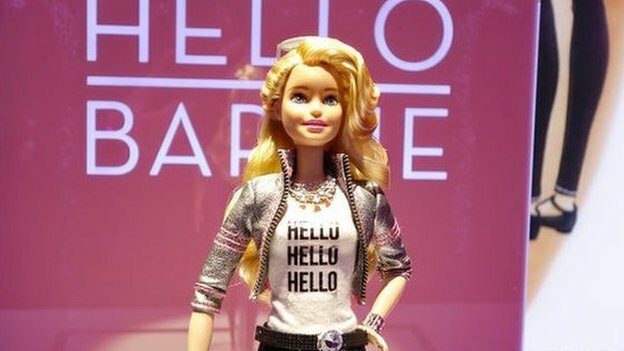 The solution is simple: the new “Hello Barbie“, connected to internet, endowed with vocal synthesizer, manages to guess the question asked by the child and extrapolate an answer from her central database, contacted in real time through the net. We know that a part of our readers were born and raised in the 20th century, therefore they will be horrified by the idea that their favorite toy, fueled by my personal vivid imagination, may evolve in a multimedia version, robotics. We have to be honest, we, the “otherwise digital” users, feel a little bit like the actors of the silent film era in front of the first film endowed with audio, in a word: disorientated. If we don’t let this unlikely alarmist rumours distract us, we may see why this version of “robocop” Barbie has its charms: we live in a dynamic society, multimedia and interactive, but less communal comparing to the one of 1959th, year when the first Barbie has been commercialized! The children, like the adults, maybe too soon, have too many daily commitments: sporting, musical, educational… and they have few occasions of a completely free play. Each of these commitments involves transfers and it reduces the time for the free play and, indirectly, it reduces the occasions when the children may play with other children, all this while the number of the toys, per every single child, has increased. The smart tools such as video games consoles, smartTv, highly interactive electrical and electronic games have increased the receptive and implementing ability of the child who pretends stimuli to promptly connect with. In short, today’s children are more “alone”, fast and demanding. The New Barbie is therefore the temporary arrival point of a society very social and less aggregating, very fast but endowed with less free time. Moreover, it is quite clear why the Barbie doll has always been a role model, an anchor in the collective imagination! The fact that SHE is not only beautiful but also loquacious, able to express an opinion, it allows her, to overcome her own stereotype based only on beauty, even if through a robotic subterfuge. The new Barbie is therefore a direct expression of the 21st century and maybe for this reason, SHE will be very successful, (unless somebody else would invent another doll, much more intelligent and interactive). Some detail of a technical type: the doll, for now available only as a prototype, therefore not for sale yet, is endowed with Wi-fi connection, has two batteries incorporated in her legs, and SHE is able to listen and answer thanks to a vocal synthesis system. Are you curious? Here is the new Barbie. The new Barbies, the Lego, the Uber taxis, the eBooks, the video streaming, the music on demand, the APPs, the instantmessengers, are all examples where the net becomes, in an amazing way, part of our everyday life. We are all cybernauts always connected online, the Barbie doll included.